No Fenders -Formula 1, IndyCar and A Whole lot more..: 'Kuhnadiun Slapstick! 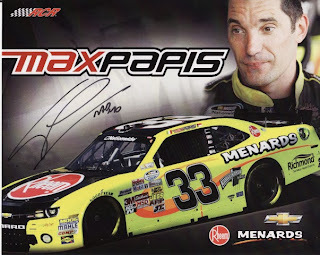 So originally I thought it was some kind of joke when I first received the news from Indianapolis that some woman had slapped Max Papis in the pit lane... Inquiring is that really true? Thus a very quick search of thee A-L-L knowing 'Intrawoodz; Err internets did reveal that some 'Floozie really had had the tenacity to slap Massimiliano "MAD MAX" Papis in the Pits after the finish of some rough tumble Racin' is Rubbin' PickkemUp Trucks race Up North Eh! In Oh 'KanaDuh! Max Papis gets Slapped by Mike Skeen's Girlfriend! As apparently Papis's fellow competitor Skeen's girlfriend Kelly Heaphy didn't like her man getting roughed up by Papis, who claimed that his wife had to witness the whole incident and that it had dislocated his jaw; YIKES! Hence afterwards, NASCAR has announced the permanent banning of Heaphy from all 'RASSCAR events along with fining her & the team's crew chief $2,500 apiece, as I have NO idea what the crew chief's offense was, unless he failed to referee said Slapfest correctly? As I guess Kelly Heaphy & Queen Danicker - ALL Hail Danica Patrick! Won't be gettin' together anytime soon to discuss who's given them the nicest pair of shoes; Hya!